Many of you congratulated me so thank you very much for that! I was really happy you guys thought about me that day! I had a great day with my family. Now to the comic! I'm close to finishing the lineart, which means there's only the colouring left. I hope to be able to get some first colouring done this weekend or at least finish the entire lineart of the comic page (which is more likely). 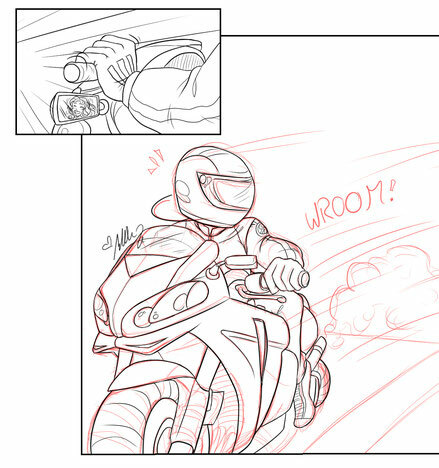 Here's a little new sneak peak of the next page. A mysterious bike rider! Oooooh! Any guesses who this might be? Let me know in the comments or on DA or Instagram! Also, I dropped you guys another clean lineart part in the archive.